We often think of Plantation shutters as the most gracious of window treatments, giving interior windows a true Southern charm. Really, there are many other applications well suited for this airy wide louver style. Over the years we have had the following questions asked and the answers show the true versatility of Plantation Shutters. Can Plantation Shutters be used as Exterior Shutters? Yes! 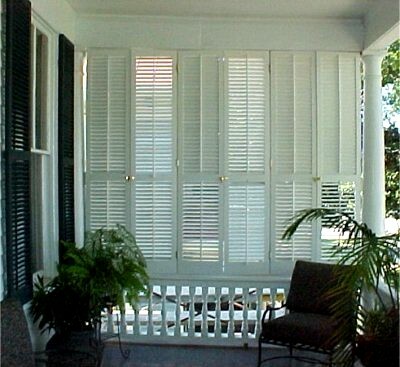 Plantation Shutters are at home as exterior shutters and even interior rooms with high huimidity. Exterior Plantation Shutters must be made with wood that can withstand harsh weather and environments. This is why we hand build our exterior Plantation Shutters out of Spanish Cedar. Spanish Cedar is a durable hardwood that is highly noted for its resistance to rot, decay and insects. Can Plantation Shutters have fixed louver blades? While Plantation Shutters are known for their ability to control ventilation and the sunlight coming in to your home, they can be made with non-moving louver blades. The fixed louver blades still allow indirect light to filter in as well air flow. 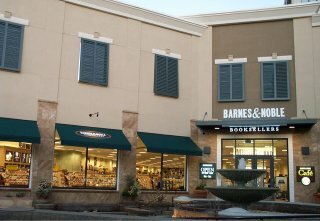 A good example are the awning style Bahama Shutters used on this Barnes & Noble Booksellers storefront. They wanted the look of Plantation Shutters without operable louvered blades. Can Plantation Shutters be used in place of trellis screening? Yes. 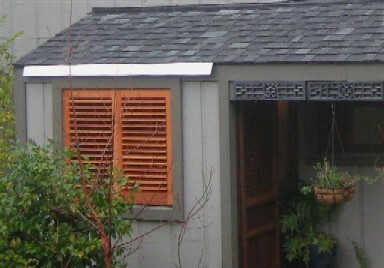 Louvered Shutters will screen a view and also stave off a gusty breeze. The airy appearance of Plantation Shutters will provide a perfectly cozy partition extending your living spaces outdoors. Can Plantation Shutters be used as interior doors? Yes. This actually adds quite a bit of functionality as it allows you to control both ventilation and sound within parts of your home. Some good examples would be doors to cover utility rooms and doors that lead from living areas into screened in porches. When Plantation Shutters are used as interior doors we increase the proportions of the stiles and rails to add stability and look proportional. Hopefully this has given you some insight in to the different ways Plantation Shutters can be used. So the next time you find yourself thinking about adding exterior shutters to your home or replacing some closet or interior doors, consider Plantation Shutters. We’ve all seen them. The closets that we use to hide things. It’s your washer and dryer surrounded by a growing mound of clothes. Your childrens toys that have multiplied and your hoping will be contained in the closet. Or perhaps it’s that slightly embarrassing collection of black velvet Elvis paintings you’ve collected over the years. Maybe you actually use your closet to hold clothes. Did you recently go to great lengths and expense to organize your closet with an array of shelves, slots and drawers so that each and every shoe has it’s own little home? That may be so, but that is no longer a reason to settle. Here at Kestrel we offer you something else: Real Doors, made from Real Wood, by Real People. We hand build our pegged, mortise and tenon closet doors in a number of different designs that will compliment your unique style. Is your room too dark? Choose a closet door style that allows for glass or mirrors. This will help reflect what light is in the room and brighten it up. Our designs feature louvers, panels and bead board in the lower portion of the door to help keep everything grounded. Plantation Louvered doors are a great way to add charm. An added benefit is that they allow airflow between rooms. This can be very important if you have a heater or other appliances that require a specific amount of air flow to avoid burning out. Go with an even larger louver blade and suddenly you have transformed your bedroom in to a tropical hideaway. Looking for something more formal? Colonial raised panel doors might be more appropriate. Switching to a flat or recessed panel will give a simple, but still traditional look. Bead board doors remind us of a beach house or a stately Victorian. Louvers over Tongue & Groove doors for that European flair. Or maybe you have your own special design in mind. Send us your PDFs or a scan of the cocktail napkin you used to scribble on that image that has been floating around in your head. Your home deserves your doors with your style, not someone elses.